As Audi said in a recent post to their Facebook page, "vehicles can always be replaced, but their passengers cannot. The safety of our passengers is Audi's top priority." That statement has been proved by the Audi A4 and Q5 each earning an Insurance Institute 'Top Safety Pick' rating. Below we've included not only the official Audi press release, but also three video crash tests of the Q5 and A4. HERNDON, Va., Jun 9, 2010 - Audi of America, Inc. today announced that the Q5 and A4 models earned 2010 TOP SAFETY PICK ratings from the Insurance Institute for Highway Safety (IIHS). The two best-selling Audi models join the Audi A3 in achieving the highest safety recognition granted by the influential IIHS. Today’s news means Audi offers more vehicles with the TOP SAFETY PICK rating than any German luxury automaker. For the 2010 model year and beyond, IIHS included a new rollover roof strength test. To earn TOP SAFETY PICK recognition, a vehicle must earn the highest rating of good for roof strength in rollover crashes. To measure roof strength, a metal plate is pushed against one corner of a vehicle's roof at a constant speed. The maximum force sustained by the roof before 5 inches of crush is compared to the vehicle's weight to find the strength-to-weight ratio. This is a good assessment of vehicle structural protection in rollover crashes. A vehicle earning a good rating can withstand a force equal to at least 4 times the vehicle’s weight. Current federal standards require a vehicle’s roof to withstand 1.5 times total weight. TOP SAFETY PICK also recognizes the vehicles that earn the highest rating of good for front, side, rollover, and rear crash protection, and that have electronic stability control, which is standard on all of these models. 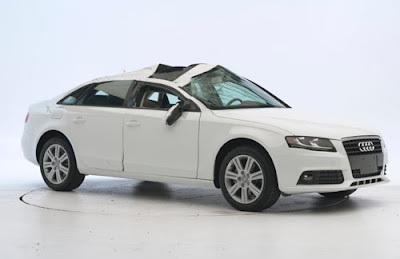 None of the three Audi models with the TOP SAFETY PICK rating required any structural changes to meet the rollover testing criteria. The A3 has been on sale in the U.S. since Spring 2005 and received interior and exterior trim updates in Fall 2008. Its year-to-date sales are up over 100% due to the introduction of a TDI clean diesel variant in November 2009. The current A4 was completely redesigned with a U.S. market introduction in fall 2008, whose sporty upgrade variant, the S4, has yet to lose a comparison test. The Q5 went on sale in the U.S. in February 2009, quickly becoming one of the most successful nameplates in the Audi global product portfolio. Audi of America, Inc. and its 272 U.S. dealers offer a full line of German-engineered luxury vehicles. AUDI AG is among the most successful luxury automotive brands globally. During 2009 Audi outsold all other luxury brands in Europe, while in the U.S. market Audi posted the largest market share gain of any luxury automotive brand. Between 2010 and 2012 the Audi Group is planning to invest around €5.5 billion, mainly in new products, in order to sustain the Company’s technological lead. Visit www.audiusa.com or www.audiusanews.com for more information regarding Audi vehicle and business issues. The Insurance Institute for Highway Safety is an independent, nonprofit, scientific, and educational organization dedicated to reducing the losses — deaths, injuries, and property damage — from crashes on the nation's highways.